Buying in bulk offers so many benefits – it’s good for your wallet and the environment! It’s a sustainable choice since it reduces the amount of packaging used. You can save up to 50% by buying in bulk, and even more when bringing in your own container. When you shop in bulk, you can buy as little or as much as you need. Our bulk bins are loaded with hundreds of products including grains, rice, oats, beans, pasta, nuts, coffee, teas, spices, granola, and much more. We also carry liquid bulk items including maple syrup, honey, oils, soaps, shampoos, and laundry detergents. If you bring your own container, weigh it and record the weight while empty. Otherwise, use a bag or container provided in-store. Fill your container or bag with the amount needed. Please use the clean scoops and funnels provided or ask for assistance if needed. We’re happy to help! Record the PLU number from the bin on the container. That’s it! Buying in bulk doesn’t mean dealing with large quantities. 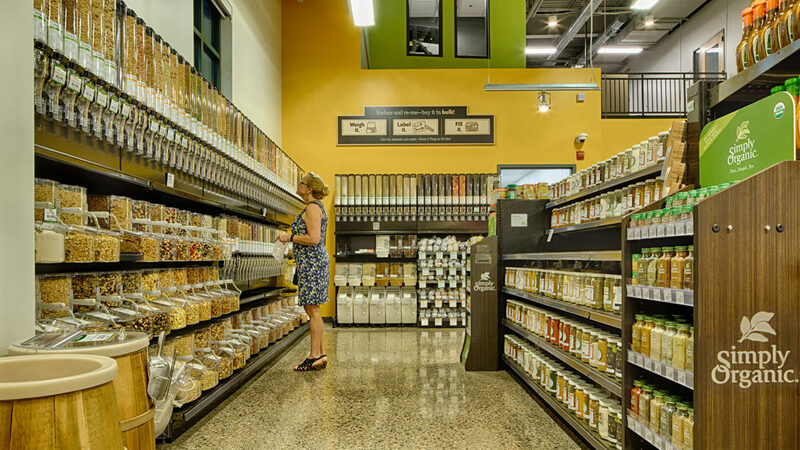 At the co-op, we’re big on bulk because it means buying products with minimal or no packaging. You may bring your own reusable containers to fill. The best part is that it’s easier on the earth and your wallet. Research shows that between 25% and 50% of the food Americans purchase ends up in the garbage or compost. Buying in bulk means you can buy only the amount you need – no waste! Americans discard 570 million pounds of food packaging each day. By bringing your own containers for bulk foods, you avoid much of the waste associated with packaged products. Without all those packages to design, manufacture and fill, our suppliers can offer us better costs on bulk foods than packaged foods, and we pass those savings on to you. Learn more about buying in bulk including tips and temperatures for storage lengths.